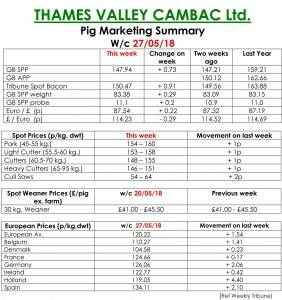 Trading for a Bank Holiday is sometimes pressured but demand this week hardly flinched, according to this week’s Pig Marketing Summary from Thames Valley Cambac. The Summary reported that most of the majors planned a full week’s kill, and required the associated supply. Numbers, however, remained very tight, with many producers still struggling to cover commitments. Prices improved again, with some healthy increases in some weekly and monthly contract contributions. 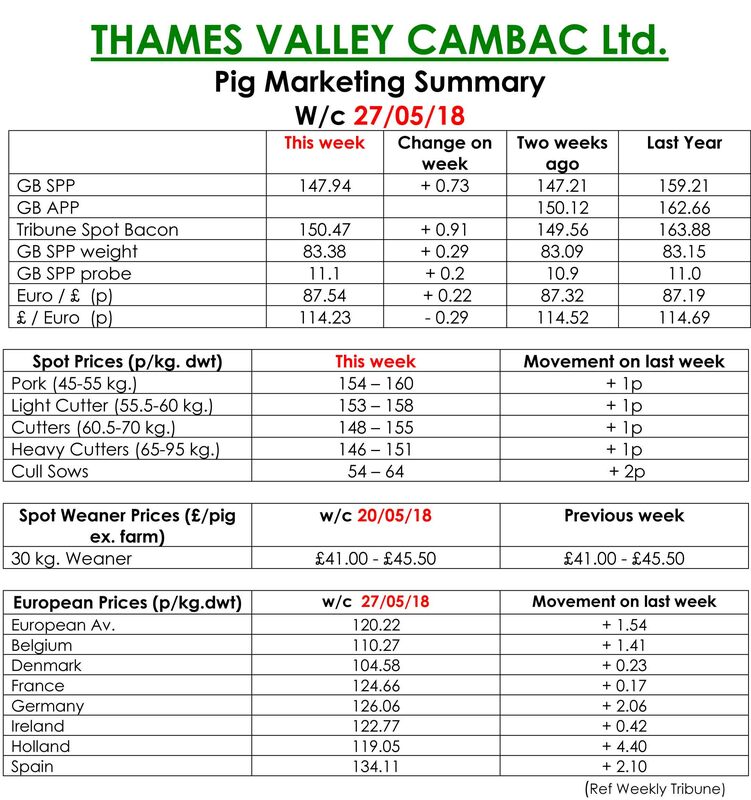 For week commencing May 27, prices improved through the upward movement of SPP, up 0.73p/kg to 147.94. The fresh meat market continued in buoyant mood, but it is proving increasingly challenging to source the smaller, lighter pig that these markets require. The cull sow market saw good demand and prices improved by 2p. In Europe, the influential German market added another 2 euro cents, which put some life into some of its near neighbour’s markets. Prices in sterling were enhanced slightly by a stronger euro which ended the week up 0.21p at 87.54p. The Summary also offered thanks and best wishes from all at Thames Valley Cambac to its colleagues George Baxter and John Perry who retire at the end of this week after many years loyal service. The Weaner Marketing Summary found that supply continued to outstrip demand, with fattening space at a premium. Supply was further enhanced by one off batches from breeder feeders wishing to ease production bubbles. The prices, announced by the AHDB, saw the weighted average for a 30kgs pig rise by £5.81 to £53.31 and the weighted average for a 7kg fall by 58p to £37.06.